Fine art photograph, selfie of David Litschel in 2013. Diptych omparison of Rufugio and Me from self portrait comparison series. 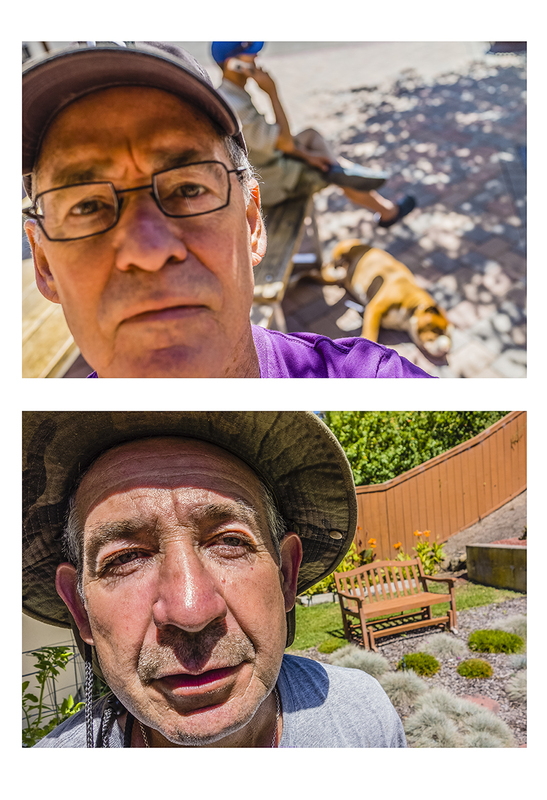 I have been interested in taking self-portraits for 40 years. It has always seemed a natural, perhaps somewhat narcissistic thing to do, as if others might be interested in the tiny details of my everyday life. However, the daily mutability of my life has always held an intense interest for me and continues to drive me to make these self-portraits. No matter whether using a Diana plastic camera or the latest digital camera, I record my presence by turning the camera lens toward myself, using the reflection in the lens as a viewfinder to compose the image. When Apple included the second camera on the side of the phone facing the user I embraced it immediately and through what I have seen on social media have realized that I share this exploration of self with many others as shown by the Oxford English Dictionary’s proclaimation of “selfie” as their international Word of the Year for 2013 http://blog.oxforddictionaries.com/press-releases/oxford-dictionaries-word-of-the-year-2013/. A self-portrait reveals our personage in general at any moment of time and sometimes aspects of time and space as well. Placed in context of a particular setting can be equally revealing about human nature. In my most recent work I have begun making visual comparisons of myself with others who are or have been in my life. This is done via the use of diptychs. I am interested in the similarities and differences in the shapes, colors, and clothing among other things in this comparison. The work does not make a judgement of this comparison, but is presented for each individual viewer to take away what he or she perceives from the comparisons in each of the diptychs.